When the snow starts to melt away in the northen hemisphere many ski bums begin to ask themselves existential questions about life, meaning and how to have as much fun outside without snow. Luckily for them and any other ski enthusiast, there are plenty of good options for skiing in the southern hemisphere. Argentina and Chile are at the forefront for the skiing in South America. Here is a list of the pros and cons of the biggest resorts in Argentina and Chile. from Santiago. With a full park, great views, and a good amount of annual snow, Valle Nevado is guaranteed to be a total blast. It´s big for southern standards with over 2,225 inbound acres of skiing and plenty of backcountry access to put some hair on your chest. It´s only 45 kilometers from Santiago. The road up has a long switchback section with over 40 turns, but in less than two hours from the center you can be getting your boots on. 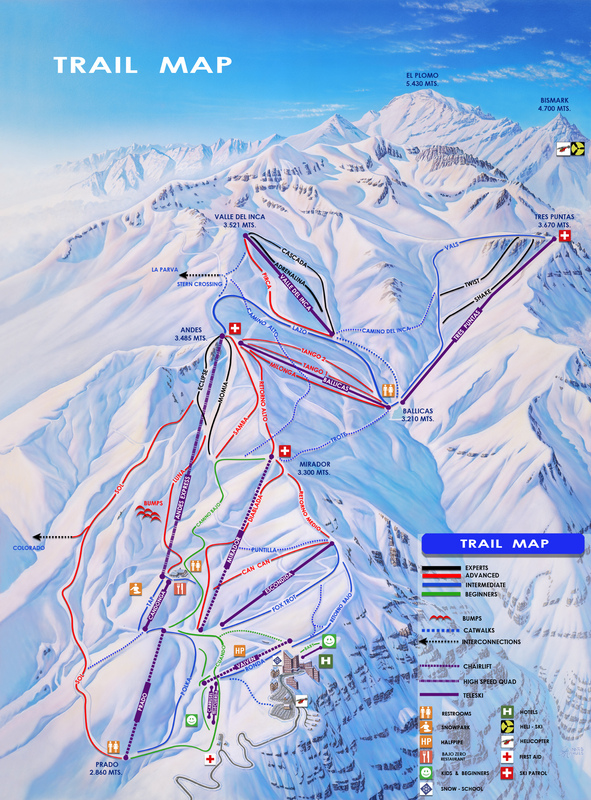 It´s literally connected to 2 other ski resorts, so you could cross over, buy a pass, and check out a whole other resort. You can see santiago from the top. They have helicopter skiing available for some long open powder runs. The terrain can be steep, but it is not as avalanche prone as in other areas like Colorado or Utah. As with any southern ski resort, the air is humid and a few days of sun can lead to rock hard conditions. A great time to test your variable terrain skills. There is next to nothing for night life, food, and accommodation. There are a few buildings at the base and nothing else. In-bounds, there is not much to test your courage. Most of the runs are quite mellow, and it takes a bit of hiking to find anything truly steep. Just on the other side of the Andes from Valle Nevado is Las Leñas, one of Argentina´s premier ski resorts. If Valle Nevado is the Vail of Chile, Las Leñas is the Aspen of Argentina. Las Leñas has some of the driest snow in the southern hemisphere. 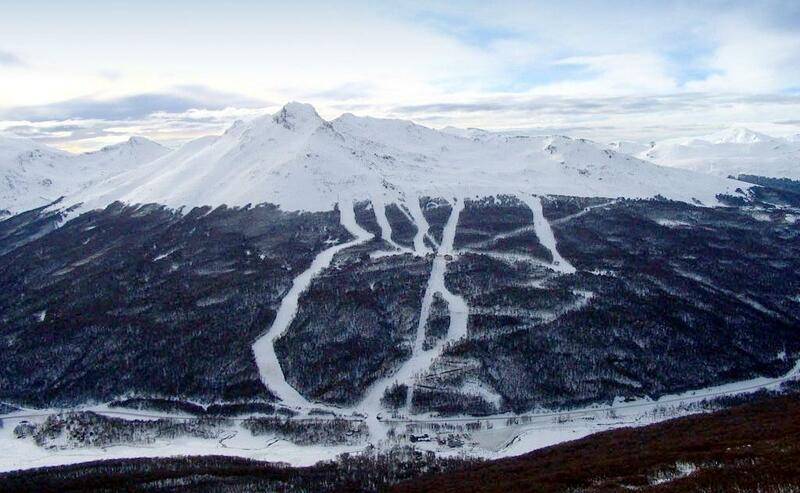 It has a higher altitude than any of the other resorts in Argentina, and it can get some serious dumps. If Valle Nevado was too tame for you, Las Leñas might be able to do it for you. The steeps here are truly steep, and the backcountry run, entre rios is a serious no-fall run. While Las Leñas excels in the steeps, it also has a long, flat run that runs for kilometers at the bottom half of the resort. It´s a great place for beginners to get a good grasp on skiing before they decide to tomahawk down a double black. Las Leñas is rather isolated, and there is not much for a night life outside of a select few bars and restaurants. A lift ticket is at Las Leñas is generally the most expensive in South America. Lessons are higher here too, but still nothing to compare to Colorado. Flights to Las Leñas can be quite expensive as the closest airport is rather small. A small resort near the boarder between Chile and Argentina holding some of the best skiing in the world. Amazing terrain is waiting for you in Portillo. Steeps, pow, and cliffs are sprawled throughout this sliver of paradise. The gnarliest run on the mountain is the super c couloir, the steepest, longest sidecountry couloir in South America. The runs are awesome, and they have snow quantity and quality to back it up. Portillo as of the writing of this article (mid-July) has the deepest snow pack in the western hemisphere with over 2 meters of a base already. There are a lot of pomas at Portillo, and some of them can be difficult to use. The infamous slingshot lift is a poma where they put up to 4 people on one poma and stops at the top of a very steep run. Many people fall at the top and sometimes fall halfway down the run. 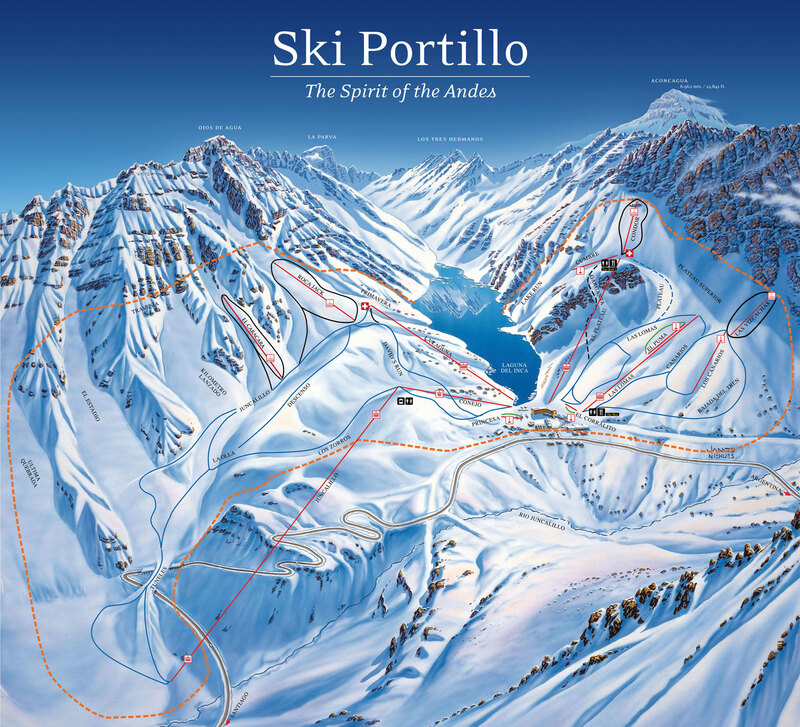 Another big issue with Portillo is its remoteness. This may be a perk for some people, but there is literally one hotel, and that is it. Good luck finding a good aprés happy hour here! Cerro Catedral is Argentina´s largest ski resort located in the city of Bariloche. Catedral has the most beautiful views of all the resorts on this list... by a long shot. The top of the Nubes chairlift will blow your mind away. The Nahuel Huapi lake can be seen from just about anywhere on the mountain, and it contends with Tahoe´s beauty, perhaps even exceeding it. There are some awesome runs here too. Inbounds there is a lot of diversity, from easy groomers to some steeper chutes. If you hike alittle, you can reach ´La Laguna´ which has been voted as the best side country runs in Argentina. Another great thing about Catedral is that it is in Bariloche, a mountain town full of breweries, restaurants, and things to do. There are plenty of other winter activities in the area as well, such as cross-country skiing, mountain cabins, and snowmobiling. The biggest letdown of Catedral is that it does not get very much snow. For most of the season you cannot ski down to the base. Downloading is never fun, and the lines can be long at the end of the day to catch a lift down. Speaking of lines, Catedral has not invested in their chairs lately, so there can be long waits to get on the fixed-cable chairlifts running at less than optimal speeds. The resort seems to trade hands every few years, so maybe Vail will pick it up one of these seasons. p.s. Vail has actually been trying to get Las Leñas for several years. Just wait, it will happen soon. Located several hours south of Santiago lies Nevados de Chillán. Chillán is one of the only resorts in Chile that actually has tree skiing. Given that skiing in the trees is one of the best things ever, you should check this spot out. After shredding in the trees all day, you can relax into the resorts hot springs. Chillán is actually a volcano, so you can enjoy the benefits of volcanic activity while thinking about tomorrow´s turns. Sometimes the weather can be warm, and the precipitation comes down in the form of rain. Coming here during a warmer part of the season may lead to some rock hard turns before the sun gets to soften that snow up. Literally meaning beaver hill, this little resort is located near Ushuaia, the bottom of the world. Being located at the bottom of the world means the season runs longer. Generally from June to October, Cerro Castor enjoys the longest season in South America. Tree skiing here is probably the most consistent in the continent. Chillan and Catedral have better quality runs, but most of the time you cannot ski the trees in those resorts because of a lack of snow. You can ski the trees here for most of the season. Castor also has a more consistent snow pattern than other resorts. They don´t often get huge dumps, but they get more of them. This keeps the groomers fresh and the trees safe-ish. The park scene here is also way better than anywhere else in Argentina. They have a really nice medium jump line and a full park crew to keep everything in good condition. This is not too common down south, so if you´re a park rat, Ushuaia is for you. The mountain is not very steep. The very top has a little bit of steeps but only for a few turns, and then it goes to a mellow pitch all the way down. This could be a pro if you are just looking to get a few casual turns in with your onesie and selfie stick though. There is also little variable terrain outside of the top quarter and the trees. Great groomers, but not too many bumps. So there you have it. Keep in mind that there are many more resorts in South America. This is just a list of the biggest, most well-known resorts. There is a plethora of little hills scattered throughout Patagonia with just a couple chairs that can bring you all the face shots and secret stashes you have been dreaming about. But just like your secret stashes back home, they´re best kept secret while waiting to be found by YOU! Sarkis: The Best Restaurant in Buenos Aires?